We pride ourselves on the excellent delivery service that we offer our customers, which is why we use TNT, the UK’s Premier Carrier. In addition to our FREE Next Day delivery service we are also able to offer a next day collection from any of TNT's depots throughout the UK. With this service you are able to collect your order from any one of 43 locations from 8am onwards. Just pick “Next Day” delivery at the checkout and input the depot’s address as the delivery address. Find out where your nearest collection point is using the Depot Locator. There is also the option to utilise the Track and Trace facility to check the status of your order. We understand that even the best made arrangements can sometimes go wrong. If your order is not delivered within the time specified by us, we will do our utmost to rectify the situation immediately, and then refund any carriage charges paid. Orders placed on the web before 5pm or by phone before 5:30pm will be delivered the next working day. 1. All free standing cabinets ordered before 3:00pm (excl. Eaton - ordered before 2pm) will normally be delivered on a next working day service, excluding some areas of Scotland, Cornwall & Devon. Areas that cannot be delivered next day are normally delivered, free of charge, on a 2-3 day service. A next day service is available to these areas, however there will be an additional charge. 2. Orders for ladders received after 4pm will be on a 2 day delivery service. 3. Orders placed on a weekend will be processed on Monday for delivery on Tuesday. 4. 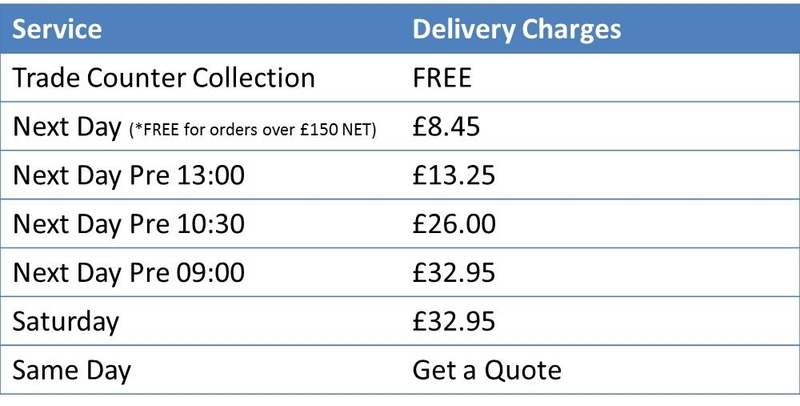 The charges below are for delivery to mainland United Kingdom only. If you are outside of mainland United Kingdom, please call for delivery costs.